A 2009 spring harvested jasmine green tea, Golden Needle King (Moli Jinzhen) comes from China's former jasmine capital - Fuzhou. According to Chinese historians, the beginnings of this popular beverage can be traced back to the mid 1890s in the capital city of the Fujian province - Fuzhou. The Fuzhou Tea Company pioneered the art of making a high grade jasmine tea using the Fuding Baihao tea plant, the same raw ingredient used in making the Silver Needle white tea. The jasmine flowers used are exclusive single and double petalled (rather than multi-petalled). According to the tea company's research, these flowers give the best scent. The ratio of jasmine flowers to tea leaves are extremely high, which means the infusion process needs to be repeated several times. Tea leaves are infused up to 7 times to create a lasting scent. Over the years, the commoditization of jasmine green tea has caused many Fuzhou producers to shut down. So imagine my joy when I discovered this Golden Needle King, a survivor of Fuzhou's glorious past. 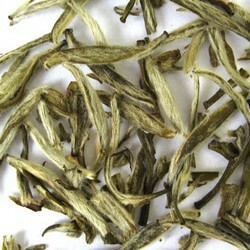 The tea leaves are of the Silver Needle white variety. Perhaps I am being harsh, but I have graded this tea as "Everyday" because the tea buds are thinner and smaller than Silver Needle AAA grade. While inferior jasmine requires a large quantity of leaves for brewing, Golden Needle King requires only a moderate amount, and easily lasts three infusions. This is promising as it means it contains high levels of soluble solids such as the calming theanine and refreshing antioxidants. In China, the best jasmine scent is described as Xian Ling, which can be translated as fresh and nimble i.e., you can feel the jasmine scent instantaneously without any repeated effort. This tea passes this test. Finally, the liquor is yellowish green with a high degree of luster. The jasmine is delightful without being overt, and is durable over multiple infusions. Both are important signs of quality. As far as the jasmine tea goes, I've really been enjoying it. It has a wonderful green fresh flavor and a nice sweetness. The jasmine aroma is lovely and pronounced. I actually like the flavor better than Teaspring's, which I seem to remember being a little more bitter. I'd rate it a 4 out of 5 overall. Just judged against other "everyday" teas, I'd give it a 5. The jasmine tea is a pleasant surprise, indeed! Elegantly flavored, sweetish, long-lasting, even persistent – actually it gave a .little flavor to cold water poured into my cup by mistake! I in particular like it at lunchtime (although I do not have Chinese cuisine at hand - ). 4 out of 5 must be my rating.